An international campaign wants to stop a non-profit environmental organization that has been functioning for more than 100 years by purporting fallacies and anti-Israel propaganda. The campaign posted an action alert on its website last Friday asking its readers not to support JNF's "Green Sunday" on Feb. 5. "Don't be taken in," the alert reads. 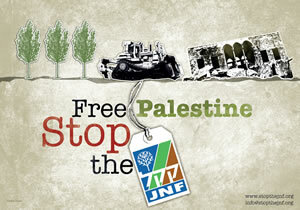 "The JNF's tree planting is a cover for ethnic cleansing." The Scottish Solidarity Campaign (SPSC) is a fringe anti-Israel organization that repeatedly uses the Holocaust to demonize Israel and has served as a platform for Holocaust deniers and Hamas supporters. The chairman of SPSC, Mick Napier, tried to justify a horrific terrorist attack in Israel by spewing lies about the school that was targeted and writing, "Palestinians continue to resist and we should be inspired by their courage, fortitude and endurance against an enemy that threatens them openly with a 'Holocaust'." In March 2008, a terrorist entered the Mercaz Harav yeshiva in Jerusalem and opened fire, killing eight students and wounding nine more. The massacre was praised by Hamas and supported by 84% of Palestinians, according to a poll taken shortly after. Unfortunately, the BDS campaign is gaining ground among youth in the United States. This weekend, the 2012 National BDS Conference is being held at the University of Pennsylvania. The conference is organized by PennBDS, a recognized student group at the University. The university is not sanctioning nor sponsoring the conference. BDS tactics have not achieved many practical results, and seem more symbolic in nature. This holds true for the Stop the JNF Campaign. Just last week Israel's Ministry of Environmental Protection in cooperation with the Jewish National Fund held an international conference on Climate Change & Forest Fires in the Mediterranean Basin: Management & Risk Reduction. The conference drew approximately 150 participants including lecturers and guests from Jordan, Kosovo, Greece, Italy, Portugal, Spain, Canada and the U.S. Additionally, JNF maintains partnerships with government and professional organizations in the United States, Egypt and Jordan. If planting trees has become an act of evil, it may be time to re-evaluate your thinking.